This post has already been read 1231 times! KEARNEY – Distance running is difficult. It takes mental and physical toughness to keep the pace mile after mile, with even the best athletes showing grimace near the finish line. There are no teammates to lean on or cheerleaders to pump up the crowd. It’s just you versus the track – and a bunch of like-minded competitors also trying to prove they’re the best. Distance running definitely isn’t for everybody, but Maddie Bach lives for it. The Cedar Rapids, Iowa, native was introduced to the sport at a young age. She completed her first 5K around kindergarten and finished the famed Boilermaker 15K Road Race in Utica, New York, when she was 8. 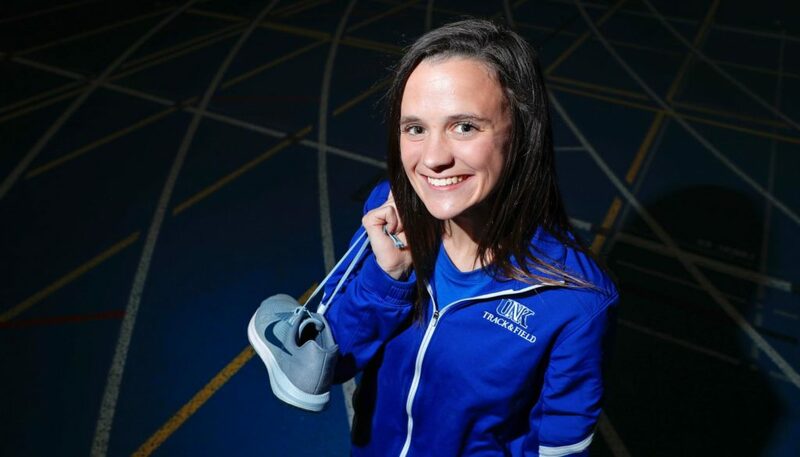 During her senior year at Marion High School, Bach posted top-five finishes in the 1,500- and 3,000-meter runs at the Class 3A state track meet and came in fifth at the state cross country championship. Her running career was headed in the right direction when she enrolled at Iowa Central Community College, a National Junior College Athletic Association (NJCAA) powerhouse, that fall. She qualified for the 2016 NJCAA Division I Cross Country Championships and finished in the top six in the 1-mile, 3,000-meter and 5,000-meter runs the following spring at the indoor track championships. Along with the success came higher expectations. Bach battled an eating disorder throughout her teenage years, reaching a low point during college. It was all she could think about. In her mind, the only way to be faster was to lose weight. Bulimia took over her life. After her freshman year, Bach transferred to Indian Hills Community College, where she suffered two leg and foot injuries in a five-month span. Physically and emotionally defeated, Bach was ready to give up on running. 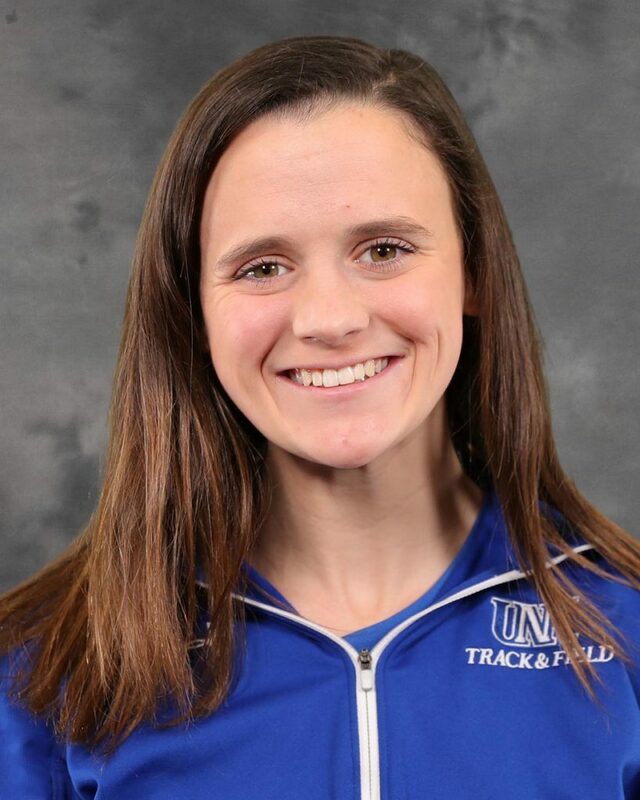 Then she got a call from UNK head track and cross country coach Brady Bonsall, who “took a shot in the dark” on the talented athlete. Bonsall had never seen Bach compete, but her times from high school and Iowa Central showed the potential. “I could tell that Maddie, athletically, was good enough,” Bonsall said. Now all he had to do was convince her to come to UNK, which was easier said than done. Bach was hesitant to move more than six hours from home, but willing to listen to Bonsall, who encouraged her to take a redshirt season while contemplating the future. She transferred to Kirkwood Community College back in her hometown of Cedar Rapids and remained in contact with the UNK coach. Eventually, she agreed to check out the UNK campus. Bach, who is studying elementary and special education, joined the Lopers in January, almost 18 months after Bonsall first reached out. “That’s a much longer process than usual,” Bonsall said with a chuckle. He knows the persistence will pay off. Bach has four victories and eight top-five finishes during the indoor/outdoor seasons, including relays, with eight times ranking in the top 10 all-time for UNK women’s track. She’s thriving in a low-pressure role and hasn’t had health issues in more than a year. The 21-year-old has a simple goal now – just keep improving and let the chips fall where they may. For Bach, every practice and event is worth celebrating. “There was a period of time when I thought about quitting, but I’m so glad I didn’t, because I just love it so much,” she said.